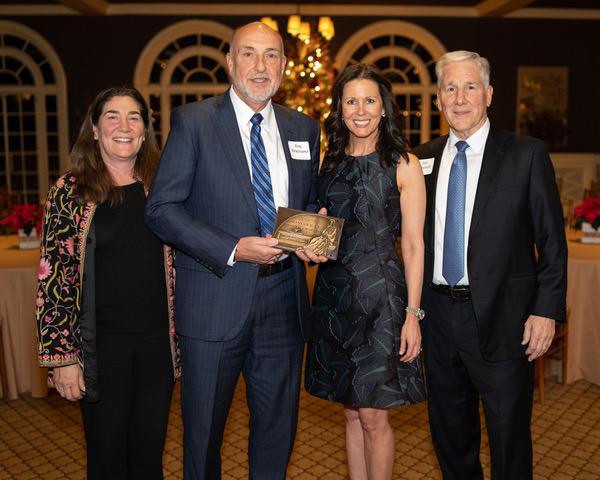 For its interior renovation of the auditorium, the 2018 Preservation award was presented to Dr. Roy Montesano, superintendent of The Bronxville School, at the Bronxville Historical Conservancy’s annual member’s meeting and holiday reception in December. After thorough review and deliberation of five fine submissions, the preservation award committee ultimately selected the auditorium as a demonstration of excellence in the Renovations and Additions category. It was determined that the auditorium renovation strongly demonstrates sensitivity to, and compatibility with, the original 1922 design, and exhibits a seamless interior integration with the building. The committee recognized the re-opening of the original tall windows on both sides of the auditorium, the restoration of the original arched proscenium, and the traditional wood craftsmanship employed to restore, and recreate, the original tudor design. In addition, the committee noted that the project intentionally incorporated stainless steel support rods connecting the wrap-around balcony rail to the ceiling, as a nod to the original lighting design and overall aesthetic. The award committee included seven professionals with expertise across a broad spectrum, including art, architecture, interior and landscape design, journalism, and city planning. The committee members were Suzanne Pratt Davis, journalist; Maureen Hackett, landscape designer; Anderson Kenny, architect; Stafford Meyer, interior and product designer; Larry Vranka, lawyer and member of the Narragansett Historic Commission, Rhode Island; and Erin Saluti and Bill Zambelli, co-chairs of The Bronxville Historical Conservancy. The Bronxville Historical Conservancy Preservation Award honors individuals, organizations, and businesses that have strengthened the fabric of our community through their exceptional commitment to preserving an understanding of its rich past and unique character. Projects that demonstrate excellence in preservation, restoration, and conservation in the Village of Bronxville are recognized for this award. Award categories are architectural restoration; conservation of architectural elements; renovations and additions; garden and landscape design; craftsmanship and fine art; preservation of the historical record; and, stewardship and advocacy. Previous BHC preservation awards have been presented to People’s United Bank for the restoration of the 1920s Gramatan National Bank Clock; Houlihan Lawrence for the exterior renovation of 4 Valley Road, the Prescott Farm Gate Lodge; and the Bronxville Library Art Collection.